Upon the birth of my oldest friend’s daughter, she asked me to make something to commemorate the occasion. 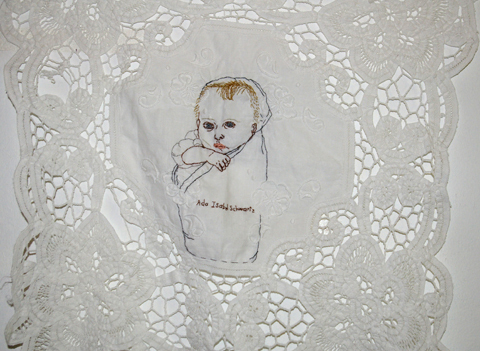 I looked through all of the online photos of her new daughter, and found one to use as inspiration for an embroidery. The base fabric is an antique lace. I think it may have been a pillow case. I thought its delicacy and detail were perfect as a frame for my embroidery. Embroidery on antique lace fabric. 2009. 9×9″. Custom.